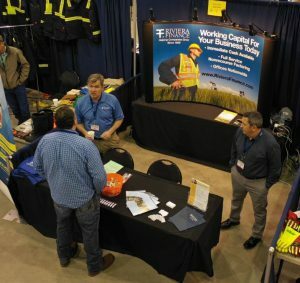 Riviera Finance was an exhibitor at the Bakken Oil & Products & Services Show on October 3-4. The event was attended by companies in all sectors of the oil industry. Riviera is a regular attendee due to our experience providing working capital to businesses in the oil & gas industry for almost 50 years. We enjoyed visiting with many of our clients in the Bakken region and learning about the new technologies in the industry. We left with a have a high level of respect for the companies and individuals working in the Bakken territory. Product and service providers in the oil & gas industry often run into cash flow problems when they have to wait 30-60 days for payment. In the meantime, they have expenses to cover such as payroll, taxes, materials & equipment, repairs & maintenance, and other operating costs. Invoice factoring provides immediate working capital. The company delivers their product or service, then sends the invoice to the factoring company. The factoring company advances a percentage of the invoice immediately. Then forwards the invoice to the client’s customer and waits 30-60 days for payment, keeping a small fee for service. Contact Us to learn more about Riviera Finance’s invoice factoring services for the oil & gas industry.